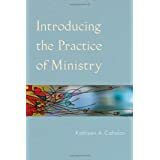 Introducing the Practice of Ministry ReviewProfessor Kathleen Cahalan has offered readers a smart book on Practice and on Ministry. While it is titled an introduction this book is comprehensive. She defines current conversations in a fresh and inviting framework that is original and foundational at the same time. The heart of her teaching is the last chapter where she presents a readable and contemporary belief in the Trinity as the dynamism of practice of ministry. This book is an invitation to vocation for all disciples. She defines ministry in service of disciples. The charisms of the Holy Spirit are not separate gifts, but enfold us in deep, abiding relationships. We imitate Christ and are literally Christ for others in our very own world. If a book can be a verb, this is one. I have read it twice and it continues to change not only my thinking, values and attitudes, but actions that become a habit. It is in the practice that we become by grace what God is by nature. Want to learn more information about Introducing the Practice of Ministry?